I'm a freelance writer and chess coach from South West London who enjoys pushing boundaries. Staines is a little way out of London but very close to Heathrow and Baroosh is situated in the High Street near to the main shopping area. It is an upmarket bar with a nice menu including tapas. It is not as busy as it should be, no doubt because of the economy. It is hard to fault the place as the menu is varied, inexpensive and the decor is superb, consistent with an upmarket image. Maybe therein lies its downfall, as Staines (or even Staines-on-Thames) perhaps does not warrant a bar as classy as this. No disrespect to Staines as I have many friends who live and work there and I love the place, but it does tend to have generated a down market image, despite the council's recent policy to rename it Staines-on-Thames as a direct attempt to address this. However, all this should not deter you from vising Baroosh. In fact it might be an added draw, as places of this quality are usually packed, but that certainly won't be the issue at Baroosh. 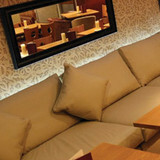 It is a lovely, classy bar that would be ideal for a cosy chat or an intimate meal. A few miles from Heathrow, Baroosh is accessible by numerous buses and you, being the classy person that you are, could give Staines the boost it so desperately needs.